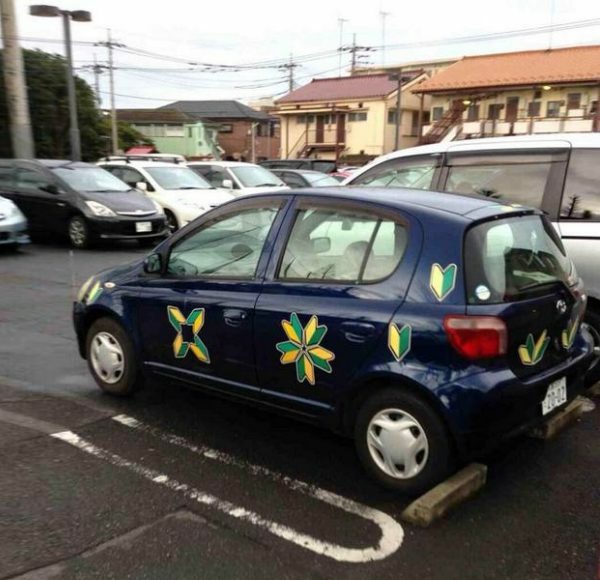 In Japan, a series of car stickers inspired by organic motifs serves both obvious and subtle civic purposes. Designed to make roads safer for drivers, the symbols also implicitly champion a maxim normally applied to internet interactions: remember the human. These car markings help reveal the person inside an otherwise-anonymous piece of machinery, acting as a humanizing avatar to the outside world. Consider first (and for contrast) the United States. Provisional student rides often sport a series of huge block-lettered stickers or even a rooftop banner indicating they are still learning. These are literal and blunt but also very limited — once the students take off their proverbial training wheels, these newly-licensed drivers suddenly go from being publicly singled out to blending completely into the crowd. 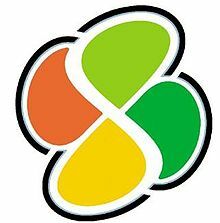 Japan takes a more nuanced approach to indicating experience levels and, starting with the Shoshinsha or Wakaba (“Green Leaf”) mark. Officially known as the Shoshin Untensha Hyoshiki (“Beginner Driver Sign”), this yellow-and-green emblem lets other drivers known to be cautious in the presence of a marked vehicle. The mark must be displayed for one year after a student receives their license but can be kept longer if the driver so desires. At the other end of the experience spectrum is the Koreisha (“Elderly Car”) mark, originally featuring autumnal oranges. Older drivers are encouraged to put an Korei Untensha Hyoshiki (“Aged Driver Sign”) on their cars when they reach age 70 and required to do so at age 75. The mark also gives drivers access to specially-designated parking spaces. 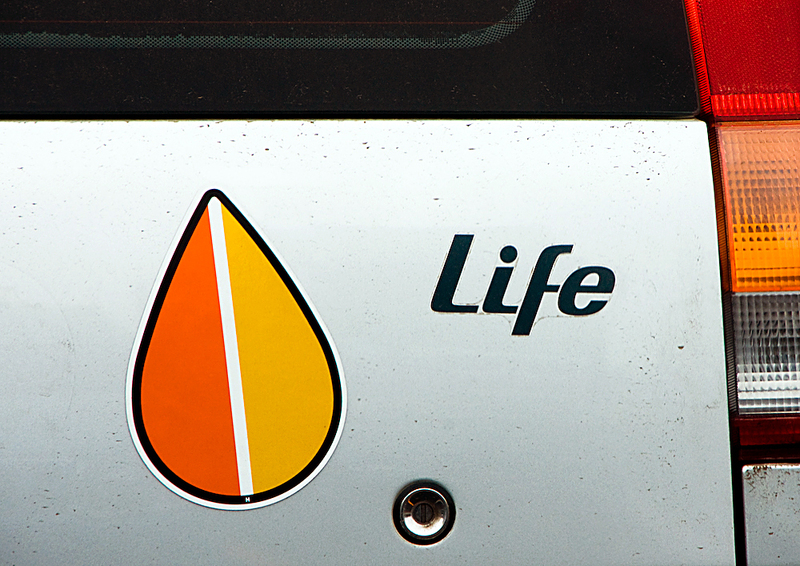 The system was instituted in 1997 but in 2011 the shape was changed from an orange-and-yellow teardrop to a four-leafed mark. The old symbol — variously called the Momiji (“Autumn Leaf”), Kareha (“Dried Leaf”) or Ochiba (“Fallen Leaf”) — was considered by some to be insulting. The replacement mark features colors of all seasons. Both marks are designed to convey something about the age of a driver, but also to couch that communication in friendly and humanizing iconography using organic visual metaphors. As with many signs and symbols, the Wakaba and Koreisha marks have taken on a life of their own in popular culture in and beyond Japan. The Wakaba has been taken to enthusiastic extremes by new drivers, as illustrated above, and has been set alongside things like web tutorials to indicate they are for beginners. The Koreisha, meanwhile, has been used by drivers who want to show they are more seasoned. Other drivers swap out the colors of the marks with flags of different countries, expressing JDM fandom from abroad. Aside from these experience-oriented marks, the Japanese also have unconventional and nature-inspired stickers for the disabled and deaf. A four-leaf clover shape uses familiar white-on-blue to indicate disability. It differs, however, from the figure in a wheelchair found on the International Symbol of Access. This departure reportedly reflects an intention for the mark to span a broader array of disabilities than the ISA implies. 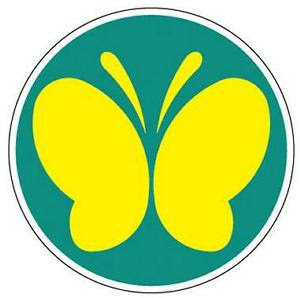 A green-and-yellow shape, meanwhile, indicates a deaf driver, the symbol combining two abstracted ears into the wings of a butterfly. In other parts of the world, L (for learning) and P (for provisional) plates serve similar roles (specifics depending on the rules of the road in a given country). Yet many of these solutions seem detached, designed to be pragmatic but lacking in delight and nuance. Japanese stickers, by contrast, offer a chance for beauty within practical design — they also bring back a degree of humanity to our otherwise impersonal interactions on open roads. i LOVE these! such great design!! Any program that enhances sheer safety on the road by bringing awareness is good with me. The wide range of drivers out there is appalling. That said, we welcome any effort to try to make it safer out on the road. I do also believe that good, responsible drivers need to be rewarded. After all they are setting a good example for all those lousy, hapless wannabes.